Chickpea or garbanzo bean is the fruit pod of a plant probably originally from the Middle-East and Mediterranean. It is widely grown as an important leguminous field crop in India, Pakistan, Iran and USA. Binomially, chickpeas belongs to the Fabaceae family, in the genus: Cicer. In India, the beans are called as Bengal gram. Desi, kabuli types and split Chickpea. Chickpea is a drought tolerant, cool season crop. It prefers well-draining, neutral-PH soil and low day temperatures for optimum growth and seedpod development. The plant is a dicotyledonous, bushy shrub, and bears small, pinnate-compound leaves. 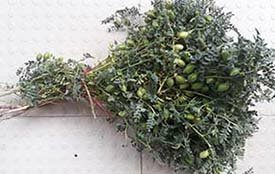 Chickpea plant-Note for seed pods. Unlike in other peas and beans, chickpea pods are short and swollen, containing 1-3 seeds. Depending on the variety, they can be pasty; some have a nutty flavor. 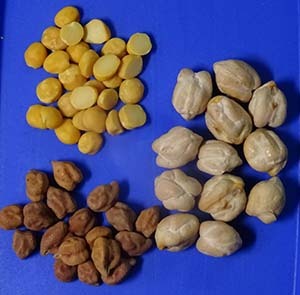 Desi type-chickpeas cultivated mainly in India and Pakistan. The duration of crop is less than the kabuli type. The seeds are smaller in size with relatively thick seed coat coming in many different colors; reddish, green, brown, black, and cream colored or almost black. Kabuli type-The seeds are bigger with smooth, waxy surface and thin cream-color seed coat. It is commonly grown in Persia, around the Mediterranean and in the US. Like other legumes, Garbanzo (chickpea) too contributes as vital source plant proteins, especially to the vegetarian population of Asia. They carry 378 calories and provide 19.47 g or 34% of recommended daily values of protein. They contain good levels of dietary fiber. Dietary fiber works as a bulk laxative that helps to protect the colon mucosa by decreasing its exposure time to toxic substances as well as by binding to cancer-causing chemicals in the colon. Dietary fiber has also been shown to reduce blood cholesterol levels by decreasing reabsorption of cholesterol binding bile acids in the colon. Chickpeas, like soybeans, contain O-methylated isoflavone compound, Biochanin-A. Biochanin A is a plant-estrogen. Studies suggest that it has a definitive role as anti-cancer diet programs. Some of other isoflavones in them are glycitein, genistein, daidzein and formononetin. Isoflavones have been found to reduce post-menopausal cancers and osteoporosis. Garbanzo beans are excellent sources of B-complex vitamins. 100 g dry, mature beans hold 557 µg or 134% of folates. Folate, along with vitamin B-12, is one of the essential co-factor for DNA synthesis and cell division. Adequate folate in the diet around conception and during pregnancy may help prevent neural-tube defects in the newborn baby. Futhermore, they compose very good levels of many B-complex vitamins, particularly vitamin-B6 (pyridoxine)-41% of DV, thiamin (vitamin B1)-40%, pantothenic acid-32%, riboflavin-16%, and niacin (10%). Most of these vitamins works as co-factors for the enzymes in carbohydrate, protein, and fat metabolism. In addition, chickpea contains minerals calcium-6%, iron-54%, copper-73%, zinc-25%, and phosphorus-36% of DV (daily values) Potassium (15%) and sodium (1.6%) are other electrolytes found in them. Potassium electrolyte is present in cell and body fluids. It helps counter pressing effects of sodium on heart and blood pressure. Harvesting may be undertaken mechanically once the whole plant and seed pods turn yellow and dried under the sun. Threshing and winnowing methods applied for seed separation. Unlike as in other long bean varieties, seed dispersal is not common in chickpeas. In the markets, choose dried garbanzo beans. Thier seed color would not come in the way of quality. In the US markets, dried chickpea in bulk bins, canned, sprouted, flour available in the supermarkets all year round. At home, store dry garbanzo beans in air-seal plastic/metallic bin in a cool, dry place away from high temperatures and humidity. Young tender chickpea pods are also a delicacy and treated much like vegetables in India (hara chana). Green chick-peas store for short peiods. To enjoy, use them soon after the purchase. Soak chickpeas for 6-10 hours before cooking. They can be left to soak overnight and ready for cooked next day. This reduces the cooking time by about 1 hour. In the pressure cooker, soaked peas cooked for 20-25 minutes and without soaked, for 35-40 minutes. Green chickpeas, picked when their pods are not yet dry, are shelled, and can be eaten raw or cooked as vegetable beans. The mature seeds, fresh or dried are prepared in the same way as the seeds of other legumes. Unlike most of other beans, however, they do not disintegrate when cooked. Boiled dry garbanzo beans are used in a variety of appetizers, soups, dips and main dishes. Boiled beans are delicious cold in mixed salads or pureed. Whole and split chickpeas (chana dal) are popular ingredients in curry preparation which served on rice. Choley or chana masala is one of the most popular dish served with roti, or kulcha in India, Bangladesh, Nepal and Pakistan. Hummus is a Middle-eastern specialty dip prepared with boiled, mashed chickpeas, mixed with tahini and olive oil. Falafel (special bean croquettes) is a Egyptian preparation based on chickpeas. They are also items in several specialties from the south of France, in particular, its stews and hot pot dishes. Puchero is a Mexican hot pot dish and cocido madrilèno is a Spanish chickpea-based stew. Chickpeas are one of the traditional ingredients in couscous dish. Chickpeas can be roasted or sprouted. Its flour (besan) is especially used for batters, unleavened breads and flatbreads. Roasted chickpeas (bhuna chana), salted or unsalted, are often eaten as snacks in the same manner as peanuts in the Indian subcontinent. Chickpea rarely causes food allergy. However, they often cause gaseous stomach distension and mild stomachache. Adzuki beans nutrition facts and health benefits. Lima beans nutrition facts and health benefits. Fava beans nutrition facts and health benefits. Soybeans nutrition facts and health benefits. <<-Back to Legumes from Chickpea nutrition. Visit here for an impressive list of vegetables with complete illustrations of their nutrition facts and health benefits. Stanford School of Medicine Cancer information Page- Nutrition to Reduce Cancer Risk.